There it is in the very first bar of Janacek's Jenufa (Her Stepdaughter, as the 1955 vocal score I bought second-hand in Prague still calls it), the sound of the revolving mill wheel. 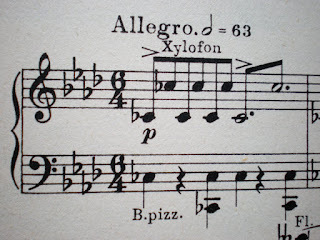 Janacek went and checked it out, finding his own musical equivalent in the shape of a low xylophone, not a typical sonority for 1903/4 (Strauss two years later was still calling it a 'wood and straw instrument' for Salome, though of course Saint-Saens had got there several decades earlier with his rattling bones). 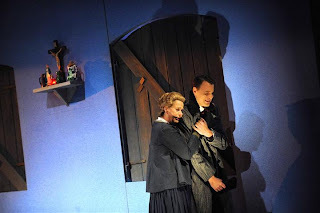 And the mill wheel still revolves at Glyndebourne as ominously as it did back in the late 1980s when Nikolaus Lehnhoff's ageless and, for me, unsurpassed production first stunned us all. 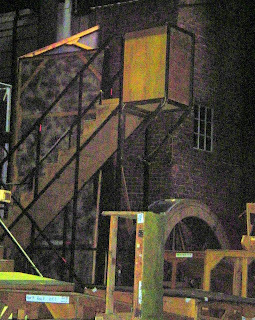 Here it is backstage, where we caught a glimpse of it on a whistlestop tour kindly organised for nine-year old Lucien and his mother Clare before the schools matinee of Falstaff. 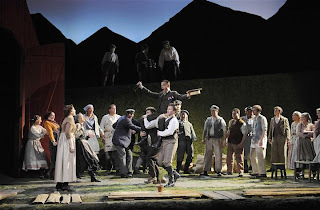 It's something of a miracle how the latest Glyndebourne on Tour team manages to come up with a Jenufa revival offering as many resonances as Lehnhoff's previous line-ups, among the casts of yore the unforgettable Anja Silja as the Kostelnicka, Roberta Alexander and later Amanda Roocroft as Jenufas to make stones weep, Langridge as the febrile Laca. But it has. Perhaps I have a little foreknowledge from seeing the way Robin Ticciati worked with the covers the previous Sunday (see below). Anyway I'm convinced that much of the latest power comes from his close liaison with singers on text, meaning, pacing, nodal points of expression and above all the power of holding a silence. There were three such heart in mouth moments in the harrowing second act, and one to cap them all between the C major blaze to which the Kostelnicka goes to face judgment, leaving the maddened village lads to wreck her property, and the radiant, harp-rippling B flat initiating Jenufa's and Laca's final determination to face whatever the future holds together. yielding to the youthful fear of the Kostelnicka in the second. 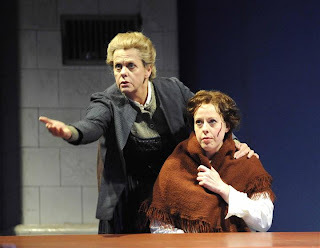 There were also heart-stopping beauties in unexpected places, like the lovely little chorus in which the village girls lead the restrained but still fun-loving Jenufa in the last act. 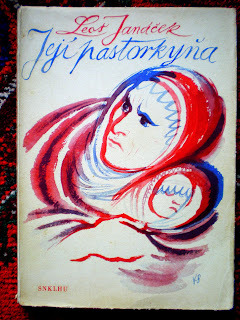 Ticciati's insistence on clear-sighted truth is awe-inspiringly matched by Anne Mason's Kostelnicka. Anja left indelible phrases behind, but Mason can find different qualities: more tenderness, generosity of spirit and, in her final speech, a core of emotional strength which made me sit up ramrod straight in my seat. If Giselle Allen didn't pierce the heart in every gesture or phrase, her depiction of Jenufa's development and especially the laser-like focus shared by Peter Wedd's Laca in the final scene were just as impressive as the different characterisations of her predecessors. All the smaller roles were flawlessly delineated. 'It's an earthquake', promised the taxi-driver ferrying us back to Lewes Station the previous evening, to which I have to add a pat-on-the-back comment from a gentleman who'd been to the study day and brought four friends along to my condensed talk on Saturday because he'd been 'thunderstruck'. I think the kids at the special showing of Falstaff would mostly have said 'awesome' in response to Richard Jones's gag-laden and consistently resourceful evocation of 1940s Windsor (I can't wait to see his Annie Get Your Gun). Brownie points to Katie Tearle and her super team in the Education Department for making the afternoon work so well. I'll be brief about this: it was just a marvel to hear the enthusiastic roars of youth, their minute-long applause at the laundry-basket antics long before the curtain came down, their attentiveness to the forest magic in which Elena Tsallagova produced the most perfect singing of the evening as a Nannetta who, for me, scored over Adriana Kucerova in the main season (I may just have heard the delightful AK on an off night). Here she is with her very good Fenton, Nicholas Phan, photographed by Bill Cooper. As for the rest, well, the tricky ensembles need tightening and Jonathan Veira has everything going for him except that he isn't Christopher Purves, the Falstaff of the production's first showing. But he's charming, has pathos and knows how to work an audience. There have been a few economies for the tour: the swan and the Eton schoolboys have gone. But I don't remember Mistress Quickly snatching a discreet kiss from a lady who turns out to be her lady at the end of the superb Windsor High Street scene. Lucien, ever unpredictable, especially liked that transitional tableau, though of course he had also been in ecstasies of delight anticipating Sir John's come-uppance in the casa Ford, inevitably the highlight of our earlier excursion to the Globe Merry Wives of Windsor (when it would have been the Page household, but I managed to dissuade Lucien from harking back to Shakespeare when he was earnestly trying to sort out his Alices, Megs and Nannettas in the synopsis). Anyway we were fortunate that the rain held off for our walk across the ridge after a bookshop browse and a stop at the deservedly popular Bill's in Lewes. 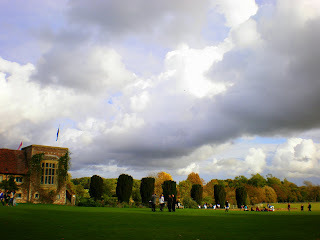 We were also lucky with a briefly sunkissed picnic followed by a stroll around the lake, now very much plunged in autumn after the late-summer feel of the previous Sunday. What fun, too, to see the lawn turned into an endlessly reconfigured school playing field. On Jenufa day the rain was seeping through the Ebert Room roof and only at half-time could we venture much outside. 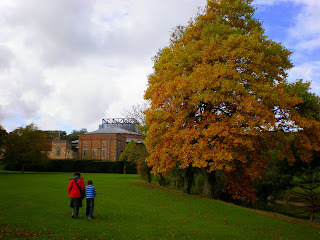 But the magic of Glyndebourne holds in any season. 29/10 The films of the Discovering Music on Musorgsky's Pictures at an Exhibition are now up and running, linked as I write from the main Radio 3 webpage. They're supposed to be there in perpetuity, unlike the abridged radio version, which has already had its seven days of extended life. Ashley Wass's more substantial and hyper-poetic playing, of the Musorgsky miniatures 'Une larme' and 'Au village', comes in the background sequence, following my contextual blether which starts a couple of minutes in, and we pop up again towards the end of the 'analysis' film. My feelings about speaking spontaneously and then finding I'm up there indefinitely for all to see are ambivalent; of course I'd edit myself. But it could have been a lot worse. So thrilled that you had as good a time as I did. I felt that Ticciati tended to shape and romanticise too much at times, but his iron grip on the pace and drama was exemplary. Richard Jones's ANNIE GET YOUR GUN is marvellous. As long as you are ready not to be presented with the urtext, then you'll have a treat. I happened to hear your building a library on Martinu the other Saturday on Radio 3- my memory immediately and involuntarily raced back to 1983 and the Edinburgh University Opera, performing the Yeasager, with Nick Macklon. I am not really in touch with anyone from those years anymore, but can I ask a mordaunt question: have any of our contemporaries died yet? We are all getting old, you know, well into middle age. I enjoy a good funeral, particularly a full-blown requiem, with mozettas, birettas, the whole works. How could I forget? But didn't we bump into each other at a Prom subsequently? Well, I have no news to sate your morbid side. I HOPE you will be pleased to know that Lottie thrives, mother of our goddaughters (if you trawl way down, you'll see pictures of both her and them). (I found a Seven Deadly Sins crowd scene photo with you as a paperseller and her as a flapper). Even saw the adorable Dr Roger Savage in August. Now retired from academic life but as curious about everything as ever. Nick Macklon and Vivienne have a large family. Chris Lambton has reared another family with another godchild in it. Anyone else? Thanks for the update on other members of the cast, David. For a gay man you devote a lot of your reply to the fact that other E.U. Opera Society members have had children, instead of saying anything else about them. Getting broody, old fellow? Or is there a closet heterosexual in there waiting to "come out", meet a nice woman and have some kids of his own? Don't know if you're trying to be funny in a friendly kind of way, Lobo, but that doesn't come across in a very kind way. I had a mind to moderate it, but since I have nothing to hide or keep closeted, I'll answer it in brief. You asked about the people we had in common. I told you. Two are very dear friends who have godchildren I adore. Yes, they're the nearest I have to kids of my own and though I don't see them that often, I care about their future and follow their path to university with great interest. Very happy and proud about 21 childless years of commitment, three of them civilly partnered, thanks very much. Now be nice or be gone! Ooh, David, testy,testy! I was only being silly, as I'm sure you knew. I WAS genuinely interested to read of the fortunes of the other members of Edin Univ Opera. My own opinions of them: Nick Macklon a good bloke, and very ambitious with it. Roger Savage had a simply fantastic knowledge of drama and opera - I only wish I had had more knowledge of both at the time to be able to pick his brains. Lottie had the kind of beauty and charisma which normally knocked people flat; she really could change a room just by walking into it. What happened to Nick Pratt, by the way? I enjoyed your Building a Library and have ordered the Jervi BIS recording which you finally recommended. I sincerely wish you all the best and look forward to other radio 3 offerings. Thanks, Lobo. You'll forgive my shearing that one adverse comment about someone whose feelings I wouldn't want to hurt (needless to say, I'd respond that you would simply have to know that person well to judge). 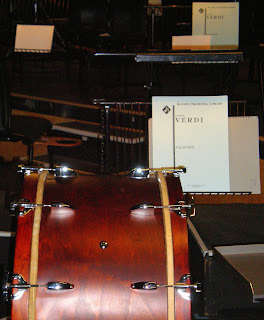 Anyway, I hope you got Jarvi's Martinu in the Brilliant bargain box of all six. For some reason R3 didn't care to trumpet that at the time, or it may be that BIS has revoked the licence. Good news is that Belohlavek's next four Barbican instalments in the spring are selling fast, so spreading the Martinu word really seems to have worked this time. about the person I commented on, which you moderated(ie censored), I am afraid you are WRONG - I knew him all too well, especially when he referred to me as a "slitty-eyed monster", to guffaws from his fellow public schoolboys. Still basking in the reflected glory of the old Etonians, David? I am enjoying the Jervi recordings of Martinu although I had to order these CDs singly - the box-set is unavailable.